Texan Multi-reedist Jimmy Giuffre is that most rare of jazz musicians, with a foot in both the cool and avant-garde camps. He first made his reputation as a clarinettist in the Woody Herman orchestra where his ‘Four Brothers’ composition became a hit early on his career. 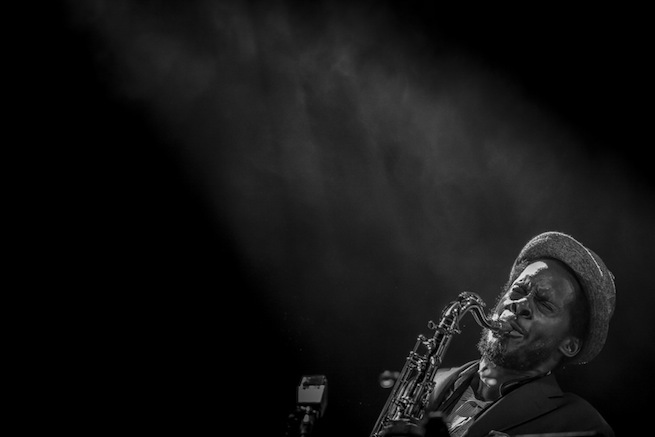 However, by the mid-1950s he had left behind larger swing ensembles for small group modern jazz, sometimes referred to as chamber jazz. For Atlantic records Giuffre constantly experimented with unusual trio line-ups including guitar, reeds and trombone and most famously bass, guitar and reeds. Out of the latter came his most endearing piece, ‘The Moon and the River’, which became a hit in the mid-1950s and a live performance was seen on the seminal film, ‘Jazz on a Summer’s Day’ from 1958. By the early 1960s, however, Giuffre had left behind the cool school of the West coast for freer forms and his 1962 trio recording for Columbia, ‘Free for all’ was way ahead of its time and caught both his label and the jazz public in general off guard. It was a sensational line-up of musicians including pianist Paul Bley and bassist Steve Swallow (the trio would also record ‘Thesis’ and ‘Fusion’ for Verve, both widely available on a superb ECM 2 CD re-issue), yet such was the conservative nature of the buying public at the time that the trio found it impossible to support themselves long-term and eventually were forced to split (though thankfully re-united once again in the 1990s and this time were extremely well received on a European tour and new York concerts). Even worse, Giuffre lost his major label deal when Columbia became disenchanted with his new style and between 1962 and 1971 Jimmy Giuffre did not record for any label. This is where the newly unearthed set of recordings come in. Despite the lack of interest from record companies, Giuffre still managed to tour and thanks to a sound engineer and young jazz DJ George Klabin, was able to secure a recording date, one a free Sunday afternoon in the empty and intimate setting of New York’s Judson Hall, and the other a live date in front of an audience at the much larger Wollman Hall with a multi-purpose stage. Ironically Klabin had then only recently been appointed head of jazz at the Columbia radio station, the very label that had let Giuffre go in the first place! The two separate set of recordings both date from 1965 and yet vary significantly in terms of line-up and instrumentation. The second is the more conventional of the two with Don Friedman on piano. Bassist Richard Davis and regular Blue Note drummer Joe Chambers provide the thrilling rhythm section on the first date and there is an idiosyncratic take on Ornette Colemans’ ‘Crossroads’ (the only non-original and Giuffre was an admirer of his fellow Texan tenorist) while on the blues-inflected ‘Cry, Want’ Giuffre’s plaintive clarinet offers a wonderful contrast to the rest of the group. Barre Philips takes over bass duties on the second date with Friedman providing atonal support on piano. There is some overlap between the pieces performed with three titles, but even then it is fascinating to compare and contrast versions with the varying formations and Giuffre’s use of folk melodies means that the music never really sounds dated and has a true timeless quality to it. A highly informative booklet rounds matters off with an excellent insight from former French Jazz Magazine journalist Philippe Carles, personal recollections by musicians Jim Hall and Steve Swallow. 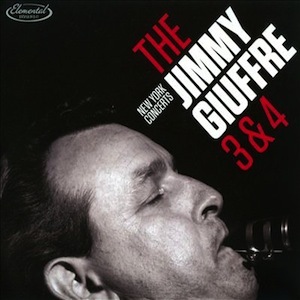 In short, Jimmy Giuffre is an innovative musician demanding of your attention and these excellent quality live recordings demonstrate precisely why. “When I listen to my recordings, I hear an obvious debt to Louis, and on those early records to Bessie Smith, as well as Jelly Roll Morton, Bing Crosby, Billie Holiday and [Reverend] Gary Davis”. A major impetus to Van Ronk’s own appreciation of roots music came with the release in 1952 of Harry Smith’s ‘Anthology of American Folk Music’ that was in fact a new Folkways recording at the time. This anthology introduced the world to then relatively unknown musicians of the calibre of Mississippi John Hurt and Dock Boggs among many others featured. 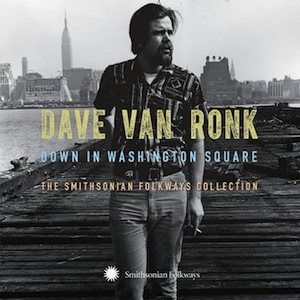 What Smithsonian Folkways have done is to compile a triple CD offering of the classic 1958-1960 recordings of Dave Van Ronk when the singer was in his prime plus some later live recordings from the 1980s, early-mid 1990s and even as late as 2001 to provide a fine overview of Van Ronk’s career. Unsurprisingly the strongest songs date from the earlier period and Van Ronk provides fine interpretations of ‘God bless the child’ from 1963, the classic blues numbers ‘St. James Infirmary’ and ‘Backwater Blues’. The two albums, ‘Ballads, Blues and a Spiritual’ (1959) and its follow up, ‘Dave Van Ronk Sings’ (1960) are both heard here in their entirety and rightly so since they cover the singer at the peak of his powers and both would later be re-issued by Folkways and Verve. Some of the later Prestige recordings from the mid-1960s are not included, but these can now be easily obtained on CD (‘In the Tradition’ and ‘Inside Dave Van Ronk’). Of note are the complete studio dates of Van Ronk’s last ever session. While not the complete picture, at three CDs this is pretty much definitive, and even completists will be impressed at the attention to detail and depth of the recorded legacy on offer.The gatefold sleeve is typically supplemented by a lavish forty page booklet and extensive essay plus photos that portray him as every bit the outsider his reputation makes him out to be.